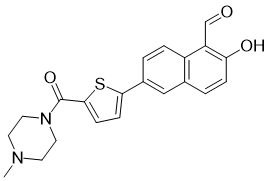 MKC3946 is a potent and soluble IRE1α inhibitor. MKC-3946 blocks XBP1 mRNA splicing and exhibits cytotoxicity against AML cells. APY29 is an allosteric modulator of IRE1α; inhibits IRE1α autophosphorylation (IC50 = 280 nM) and activates IRE1α RNase activity. STF-083010 is a novel small-molecule inhibitor of Ire1α; inhibits Ire1 endonuclease activity, without affecting its kinase activity after endoplasmic reticulum stress both in vitro and in vivo. 4μ8C is selective inhibitor of IRE1α ribonuclease (RNase) activity (IC50 = 60 nM). Blocks substrate access to the active site of IRE1α. Inactivates IRE1α-mediated mRNA degradation. Displays no effect on the IRE1α-related endoribonuclease RNase L.